Parent’s debt scenario can cause serious behavioral problems in children. Know how you are applying mental pressure on your kid from the financial angle. How children think, how they respond, and how they act are highly affected by their parents’ activities. So, how your kids will behave is totally dependent on you. Today we will see how your financial habits and your debts can cause behavioral problems in your child. What are behavioral problems and when do they take place? It is not possible for every parent to know child psychology and then start parenting. But what you can do is be a little wise and avoid doing things that cause stress and mental pressure in your child. Every child follows the principle of monkey see monkey do! So, your actions will completely influence your child’s behavior. Behavioral problems take place when the child suffers from unnecessary mental stress and tries to cope up with it by changing behavior patterns every now and then. This might sound normal and funny but it’s not. This is when ‘anxiety disorders’, ‘bipolar disorders’ or ‘posttraumatic stress disorders’ and ‘obsessive compulsive disorders’ are triggered. The early symptoms of these mental illnesses usually go unnoticed by the parents. They come to our attention only when the illnesses become chronic and acute. What are the early symptoms to trace behavior problems in kids? Your little one seems to be lethargic all the time. Have few friends or getting unsocial day by day. Prefers to be alone and her activities tend to be repetitive. Seems to be always irritated and seldom responds positively to what you say. His/her academic performance is decreasing gradually and he/she is starting to grow habits of reckless spending. There are many other signs to understand behavioral problems in children but that’s beyond the scope of this post. We will center the discussion on your financial portfolio and how it affects your child. In the present world, incurring debts is no big deal. Swipe your credit cards a couple of times and you see $500 balance in them. Plus we have mortgages, auto loans, insurances, and what not. Together it’s a burden pretty troublesome to carry. But should we actually share these financial griefs with our children? I guess not. We have our partners, friends, parents, or financial counselors to tell about our problems. Why should you bury those little brains and not let them grow up in joy? Usually, unsecured debts seem to cause more financial stress than secured debts. With secured debts and loans, your payments are regular. In many cases, the monthly payments are automated from your checking account. So, you practically have less to worry about your mortgage or auto loan. Also you have enough time to repay these loans. But with unsecured debts and revolving credits, you do have a bit to worry. You are scared of the collection agencies, creditor’s calls, and hectic visits to costly advocates. We understand your reason to panic when your credit card debts rise $10,000 or your payday loans are amounting to $30,000. So, how do all these problems of yours affect your child? 1 When you are stressed out each month by looking at your bills, you discuss these trivial matters in front of your child. Your child believes that Mummy and Papa are in serious trouble, and something very bad is going to happen. Remember, the brain of a child grows in the world of fantasy. So, even little things can feel like serious problems to them. Seeing the parents panicked, they become anxious and lose control of their mind. 2 You discuss your financial problems with your child. This gives them a feeling of insecurity. You feel relieved by telling them that you have so many debts circling you. But do you think about your child? With whom will she share her feelings? Your child gets overcrowded with negative thoughts, and depression makes its onset. 3 Your child is in high school, and you ask her to contribute to help you with bill payments. This is something we should never expect from our children. This creates mental pressure and they start to feel worthless, as they have no job, and they can’t help you in clearing your liabilities! 4 You use your child as a bet to escape creditors. Many parents ask their kids to answer calls from creditors or make use of their kids as a negotiating tool when talking to collection agencies. These parents think that hearing a child speak, or taking their kids into consideration, the creditors are going to forgive them. But in reality, this doesn’t happen. 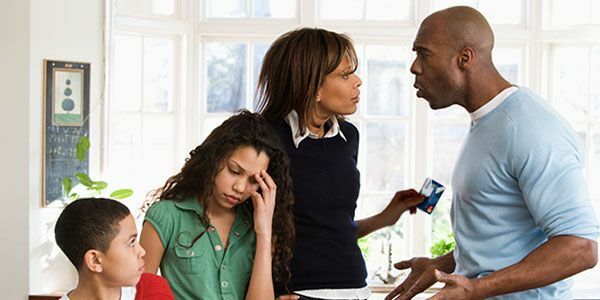 You end up both causing behavioral problems in your child and making the debt scenario worse with the creditors. 5 You ease out your temper in the moment’s heat by blaming your kids. You should never do this. A lot of parents blame their kids that because they need this and that, the debts are rising. This causes huge stress in your child. So, the next time they want a bar of chocolate, they will be scared to ask you for it. These fears and panics get accumulated time to time, just like your debts, and trigger mental illnesses even before you realize it. That’s all I can say. Your child is in your hands. You sculpture them as you want. If you think you are already at fault and your child is experiencing behavioral problems, then don’t hesitate to contact a child psychiatrist or a good psychologist. The earlier you treat these diseases, the better!